"Six figures for six feet: Some Harvey victims in Houston spend huge sums to elevate their homes" was first published by The Texas Tribune, a nonprofit, nonpartisan media organization that informs Texans — and engages with them — about public policy, politics, government and statewide issues. Despite two floods in three years, the family’s not moving. Instead, they recently paid a contractor nearly $300,000 to lift their 3,350-square-foot house 6 feet off the ground so they won’t have to worry about the next big storm. A growing number of Houston homeowners who have suffered repeated flooding — the city has seen major floods for three straight years — have decided to elevate their homes. And most, like Axelrad and her husband, largely have to pay for the elevation themselves. With a mix of their own money, insurance funds, a small grant and an SBA loan, the family of five is chipping away at the $280,000 elevation bill. They’ve stopped saving money and contributing to their retirement fund to help pay off the new debt. Like many of their neighbors, they applied for a Federal Emergency Management Agency grant to elevate their home after the 2015 flood but found themselves behind more than 200 others on the waiting list. Since Harvey, signs have cropped up left and right throughout Meyerland, signaling that homes are about to be lifted. Homes like Axelrad’s that sit in the 100-year floodplain but were built before current regulations took effect are grandfathered and don’t need to be elevated unless homeowners opt to rebuild completely. In that case, getting up to code means elevating the home 18 inches above the base flood elevation — the level to which water is expected to rise during a flood. One study in Jefferson Parish, Louisiana, focused on how homes elevated after Hurricane Katrina in 2005 had fared during Hurricane Isaac seven years later. FEMA determined that the 23 homes studied — all of which were elevated using federal, state and local funds — “would have been flooded above the finished floor” during Isaac and sustain about $2.2 million in damage. Aside from grants and loans, homeowners with flood insurance can put up to $30,000 toward elevation costs through Increased Cost of Compliance coverage if they’ve received the substantial damage designation. Abbott and FEMA are using Harvey to reinvent disaster response. Some say that makes displaced Texans "guinea pigs." Six figures for six feet: Some Harvey victims in Houston spend huge sums to elevate their homes By Cat Cardenas March 14, 2018 When Marni Axelrad and her family moved to Houston’s Meyerland neighborhood in 2015, they planned to stay there for years to come. They loved the community, and their kids were going to great schools. Then the floods came. The 2015 Memorial Day flood brought 6 inches of water into their newly purchased home. They fixed the damage and moved back in. Then Hurricane Harvey flooded the house with more than 2 feet of water last summer. Despite two floods in three years, the family’s not moving. Instead, they recently paid a contractor nearly $300,000 to lift their 3,350-square-foot house 6 feet off the ground so they won’t have to worry about the next big storm. “At the end of the day, we love our neighborhood,” Axelrad said. “Everything is great except the flooding. Here, we know our neighbors, we love our schools, it’s close to work. We didn’t want to leave.” A growing number of Houston homeowners who have suffered repeated flooding — the city has seen major floods for three straight years — have decided to elevate their homes. And most, like Axelrad and her husband, largely have to pay for the elevation themselves. With a mix of their own money, insurance funds, a small grant and an SBA loan, the family of five is chipping away at the $280,000 elevation bill. They’ve stopped saving money and contributing to their retirement fund to help pay off the new debt. Like many of their neighbors, they applied for a Federal Emergency Management Agency grant to elevate their home after the 2015 flood but found themselves behind more than 200 others on the waiting list. As of December, only 42 families had received those FEMA grants, and just nine had elevated their homes or begun construction. Those looking to elevate their homes after Harvey have two options: get on FEMA’s list and risk flooding again as they wait or find a way to fund the project themselves. “We knew that there would be more grants, but we weren’t willing to put our kids through another flood again while we waited for one,” Axelrad said. Elevation and construction company Arkitektura, which elevated Axelrad's home, estimates the cost of elevating the typical house at about $75 per square foot — or more than $112,000 for a 1,500-square-foot house. And because families still need to fix flood damage inside their homes, the final bill can be even higher. “The cost is insane,” Axelrad said. “Once you’re already spending that kind of money, I think a lot of people would rather just knock the home down and build a new one.” Axelrad is a pediatric psychologist, and her husband David Schwartz is a pediatric neuropsychologist. Axelrad said it’s good that they’re both Ph.D.s because “it takes one to figure this process out.” Letters force tough decisions Since Harvey, signs have cropped up left and right throughout Meyerland, signaling that homes are about to be lifted. For some, elevating is a requirement. Homes like Axelrad’s that sit in the 100-year floodplain but were built before current regulations took effect are grandfathered and don’t need to be elevated unless homeowners opt to rebuild completely. In that case, getting up to code means elevating the home 18 inches above the base flood elevation — the level to which water is expected to rise during a flood. 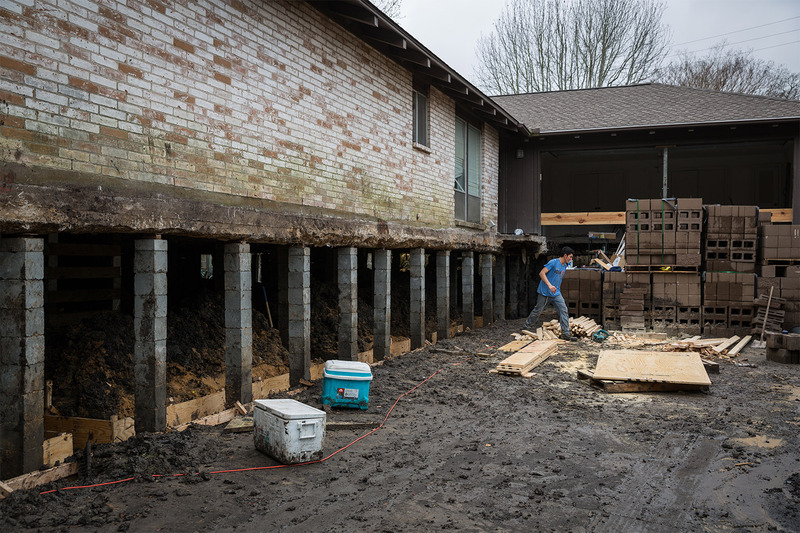 The Houston home of Marni Axelrad and her family being elevated and repaired on Feb. 21, 2018, after sustaining flood damage during Hurricane Harvey. Loren Elliott for The Texas Tribune In Harris County, homeowners who received letters from the city stating that the cost of repairing their home would equal or exceed 50 percent of its pre-Harvey market value are also required to meet current floodplain regulations by elevating — or risk being ineligible for flood insurance and future FEMA assistance. Jamila Johnson, Houston’s floodplain manager, said the city sent out 1,944 “substantial damage” letters to homeowners as of early February and plans to send out more. Homeowners who receive these letters can appeal the designation. After Harvey, Houston Public Works proposed regulations that would double the required elevation for homes in the 100-year floodplain to three feet above the base flood elevation. The Houston City Council has scheduled the proposal for a March 21 vote. Johnson said the proposed regulations are based on a changing understanding of rainfall patterns in the area. “We’re seeing bigger rains more often,” Johnson said. “A 500-year event will probably be considered a 100-year event in the future, so the city is moving to regulate them the same way. We’ve seen that these regulations help — even in an event as disastrous as Harvey. But they don’t work on homes that aren’t compliant.” These new regulations are an attempt both to mitigate future damage and to relieve some of the pressure that flood-damaged homes put on FEMA and the National Flood Insurance Fund. FEMA loss avoidance studies have found that elevating homes is an effective long-term solution. One study in Jefferson Parish, Louisiana, focused on how homes elevated after Hurricane Katrina in 2005 had fared during Hurricane Isaac seven years later. FEMA determined that the 23 homes studied — all of which were elevated using federal, state and local funds — “would have been flooded above the finished floor” during Isaac and sustain about $2.2 million in damage. The homes cost more than that to elevate — $2.4 million, primarily paid through FEMA’s Hazard Mitigation Grant Program — but the report concluded that over time, the benefits would outweigh the costs as more floods happened. The report also found that the elevated homes had higher market values, which helped the local tax base. In Wharton, a family prepares to leave An hour from Meyerland in Wharton, Randa Langerud watched as her home of 20 years was demolished by the city a few weeks after Harvey — the first of 10 in her neighborhood to come down. But they aren’t rebuilding. They’re leaving. 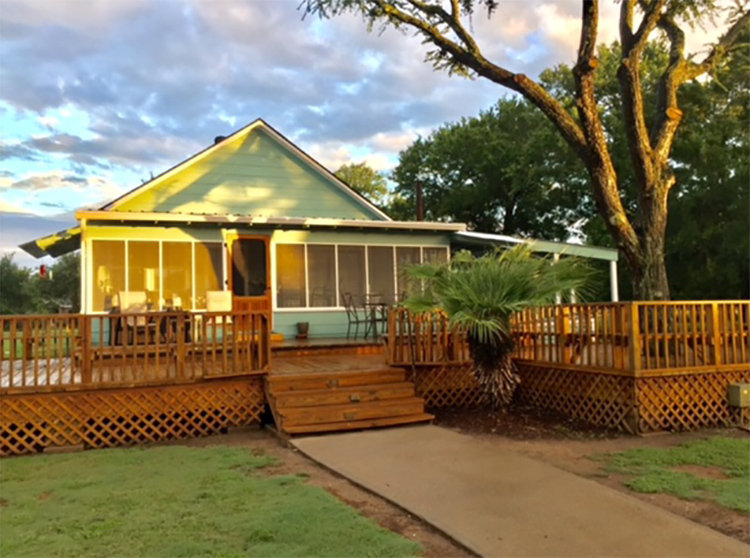 The Wharton home of Randa Langerud before Hurricane Harvey. After five feet of water flooded their home, Langerud and her husband lost everything and their home had to be demolished because they couldn't afford to elevate. Randa Langerud “It took less than four hours to demolish 20 years of our lives,” Langerud said. “That was as hard as going through the flood itself.” After Harvey sent 5 feet of floodwater into their home, Langerud and her husband began looking at their options. Leaving the house at the same elevation would have sent their insurance skyrocketing to more than $4,000 a year. Randa Langerud's Wharton home being demolished due to damage sustained from Hurricane Harvey. 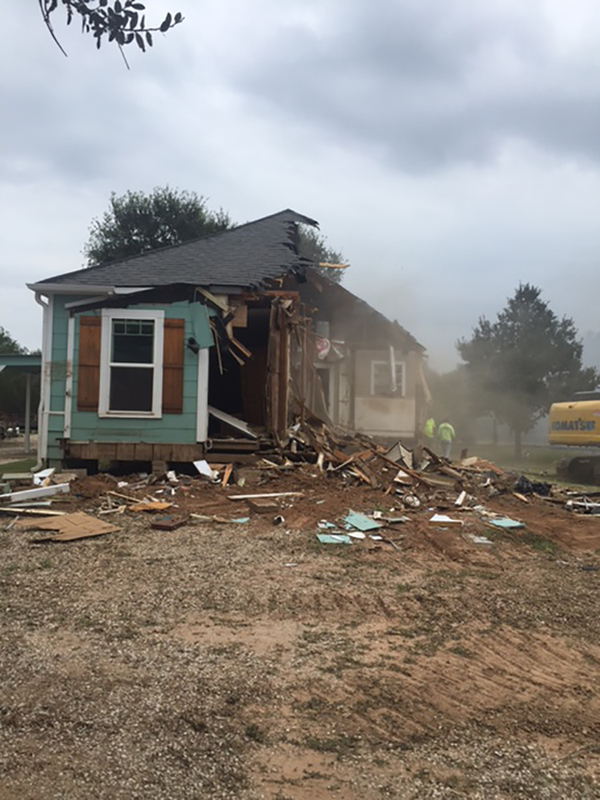 Langerud's home was the first of 10 to be torn down in her neighborhood. Randa Langerud According to the National Flood Insurance Program, insurance for a home that’s at base flood elevation costs roughly $1,410 per year nationwide, while insurance for a home that’s 3 feet above base flood elevation averages $427 per year. If Langerud and her husband wanted to rebuild, the county would require them to raise their home by 8 feet to elevate it above the flood zone — which would cost $30,000 before they even began to renovate the interior. In the end, they felt their only option was to move elsewhere. “It’s not a rich county, we don’t have deep pockets or attention,” Langerud said. “It’s really going to devastate the town because so many of us don’t have the option to raise or rebuild.” Aside from grants and loans, homeowners with flood insurance can put up to $30,000 toward elevation costs through Increased Cost of Compliance coverage if they’ve received the substantial damage designation. Even if homeowners receive FEMA assistance, they face a longer timeline for getting their home elevated, said Arkitektura founder Phillip Contreras, who works on private and FEMA-funded elevation projects. “A homeowner paying out of pocket can start the process right away, but with FEMA, there are different guidelines and regulations,” Contreras said. “[FEMA’s] only objective is that you don’t flood again. They’re using the bare minimum — the cheapest materials up to code.” For those who can find a way to pay for it, one big incentive of elevating is preserving their home’s value. Erin Anders, whose historic home in the Meyerland area was designed in 1959 by award-winning architect Arthur Steinberg, said preserving the house was a top priority. Before Hurricane Harvey, her family decided to pay Arkitektura $250,000 to raise the house five feet. “We’d be a lot better off [financially] right now if we didn’t raise the house, but if we hadn’t we’d have a house that wasn’t worth anything,” she said. 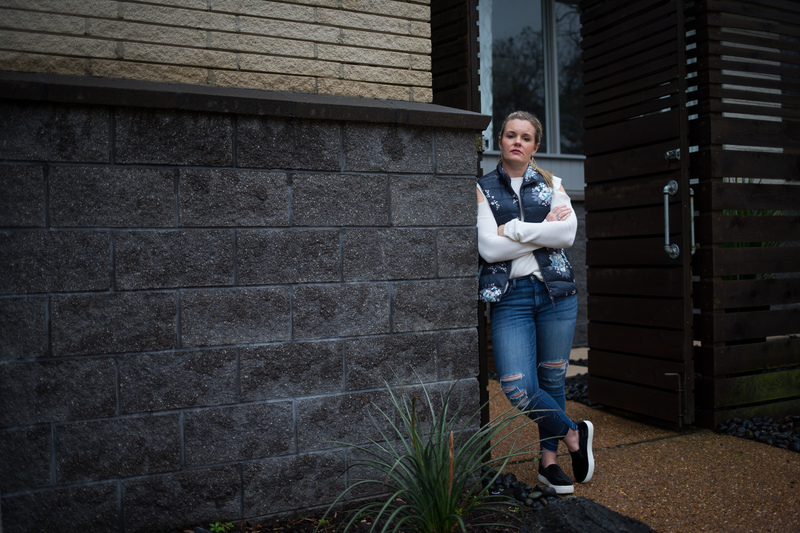 Erin Anders stands in front of her family's home in Houston's Meyerland neighborhood on Feb. 13, 2018. Anders and her husband, Doug Anders, elevated their home in 2017 prior to Hurricane Harvey, saving it from potentially catastrophic damage. The couple and their two children evacuated using inflated pool floats as the floodwaters rose around their home. Loren Elliott for The Texas Tribune Houston-based real estate broker Brandi Downey agreed, saying she’s seen flooded homes sell for just the value of the land they’re sitting on. “Homes that are being elevated now have the possibility of selling,” Downey said. “Especially in the newer areas, homes will sell for about what they sold for before the hurricane. Had they not been elevated, they would’ve had to sell for lot value.” But after the added cost of elevating a house, it might be years before many homeowners are able to break even when selling their home. Langerud and her husband are living in a FEMA trailer on their property as they decide where to go next — and how to pay for it all. They received the maximum amount of $33,000 through FEMA’s Individual Assistance Program and are applying for an FHA loan. “We literally lost everything,” Langerud said. “I know [the aid] isn’t supposed to replace it all, but we don’t know what’s going to happen.” At 52 years old, Langerud says she feels like she’s starting over. “We did everything right,” Langerud said. “We went from no mortgage at our age to having to take one out. This may never happen again, but this has forever changed our lives.” This story was produced in partnership with the Ravitch Fiscal Reporting Program at the CUNY Graduate School of Journalism. Read related Tribune coverage Abbott and FEMA are using Harvey to reinvent disaster response. Some say that makes displaced Texans "guinea pigs." Houston Mayor Sylvester Turner takes jabs at land office, which says he's got his facts wrong on Harvey response Survey: Hurricane Harvey victims still struggle to find housing, pay bills "Six figures for six feet: Some Harvey victims in Houston spend huge sums to elevate their homes" was first published at by The Texas Tribune, a nonprofit, nonpartisan media organization that informs Texans — and engages with them — about public policy, politics, government and statewide issues. Link back to the original article, which is located at https://www.texastribune.org/2018/03/14/harvey-elevate-homes-flood-houston-money-costs/.